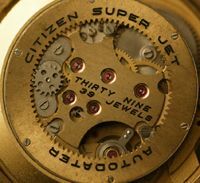 So far I’ve completed 3 articles which give more detailed information on a few of Citizen’s more iconic watch lines. The first two are very much related in that they look respectively at the hand wind and automatic Chrono Masters, plus a mention of the electric version of course! (that’s in the piece on the automatics). The mechanical Chrono Masters were launched in 1967 and were Citizen’s highest grade models at that time replacing their original ‘Chronometer’ (hand wind only) model which was produced from 1962 to 1968. The wider range of Chrono Masters included both chronometer and ‘superior’ chronometer grade pieces as well as the standard model. The two Chrono Master articles can be found via links in the Header. My third article is on the Leopard line, a range of high beat watches first produced in 1969. The Leopards were all automatics, using a swinging weight type of rotor (by then Citizen had moved away from their circular geared rotor – the ‘Jet’), and the range was extensive, featuring a number of different styles. 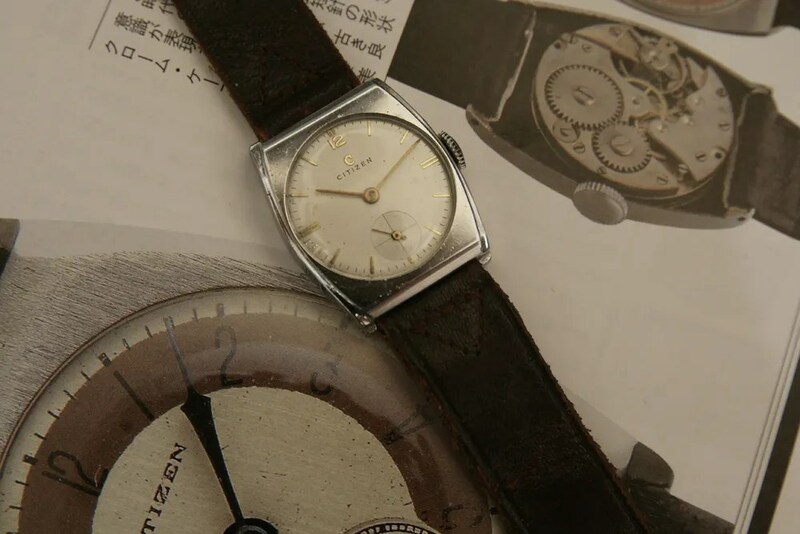 It’s probably fair to say that the Leopards started at upper mid-grade and reached distinctly high grade in the chronometer version, which features its own unique dial logo and case back medallion. Whilst most run at 28,800 beats per hour, the higher grade models are 36,000. Typically the jeweling reflects the quality hierarchy, starting at 22 jewels and reaching 28 jewels for the best ones. Often sub-titled ‘Superbeat’ the Leopard line is a great reflection of the quality of mechanical watches to be found back in the early 1970’s. My article on them is also on the Seikoholics forum via the specific Reference Data link. your description, and particularly the case number (4-020103), tells me that your watch uses the Homer 0200 movement, first made in 1960. 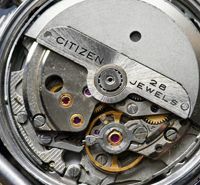 Because the dial on yours only has Citizen on it, and not a name like Homer or Newmaster, it’s not so clear where it fits in the Family Tree and the Movement Table. 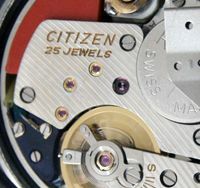 In fact it fits in the top box of the 02 Family Tree, marked 020 Homer – and in the Movement Table it is part of the 0200 Homer group on page 2. I believe yours is an export model, since it has no name on the dial, but does have Unbreakable Spring and Water Protected which are not found on Japanese domestic market models. At first I wasn’t sure that these were authentic, but I’ve had another question about them and seen others for sale and they are correct models. I have seen some watches for sale with Unbreakable Mainspring on them which I don’t think are original. I’m sorry it was not possible for you to find it in the reference material – I think I will now add something to the Movement Table and the Family Tree to make them easier to find. The 0200 Homer moveemnts were made from 1960 into the 1980s – since yours has a model number – 63-5537 – which weren’t used until the late 1960s, so I think yours was made in August 1972. Thank you! This helps a lot. anyway, What do you think about the possibility that it may be, however, 1962 because it is water protected, not resistant? It is, indeed, an export model, sold in Finland. Hi Make – the main reason I think it’s 1972 is because the style of the model number – 63-5537 – wasn’t used until the late 1960s. 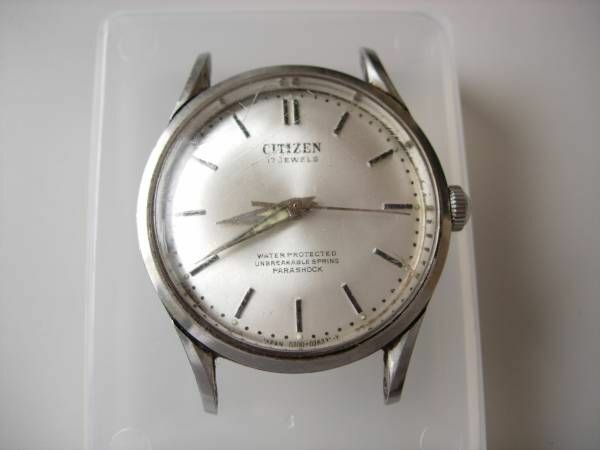 Also 1962 would have been fairly early in the production run and I’m not sure Citizen would have been exporting them very widely at that time. There are some comments on the ‘Hand Winders’ page from ‘Jay’ who has one of these, which belonged to his grand father and was produced in 1966. The case back on his doesn’t use the style of model number you have on yours – it’s a simpler four digit number. I know that water ‘proof’ (usually ‘Parawater’ on Citizens) was dropped around 1970, but I have a 1973 ‘parawater’ model so there was some phasing out and in going on, so I don’t think ‘water protected’ means it can’t be from 1972. It’s great to see one of these first wristwatches from what is now the world’s largest watch manufacturer – who’d have thought it at the time? 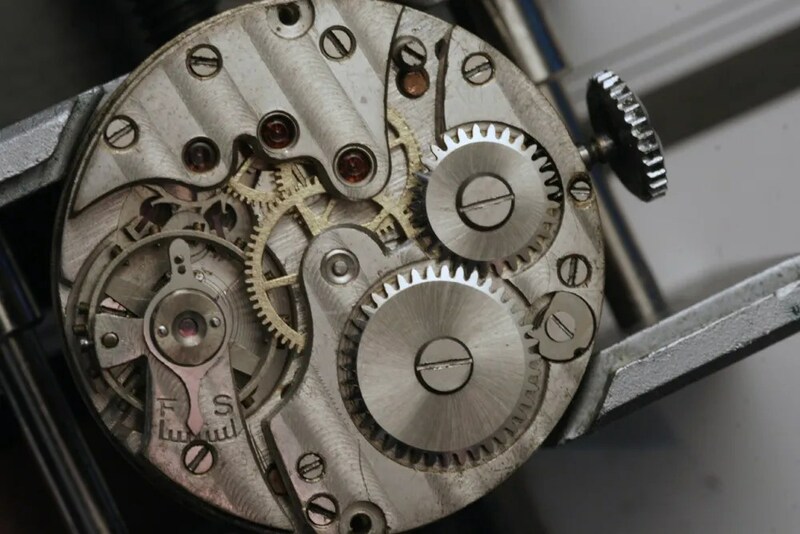 – a little bit of horological history. Later design changes were introduced in 1948 which used plates with straight edges and look very different from the early ones. So, my view is that yours is an early 1930s model – but the top plates are unusual and I can’t verify whether it is fully original or not. I’ll have to keep an eye out for more pics to see if another one like yours appears! I recently inherited a Citizen College Alarm Parawater 17 jewel wristwatch. I believe it is from 1960, as the serial number starts with “60.” It also says “S.S.” and “Star” on the back, as well as “Citizen Alarm.” It has two wind knobs to set alarm, time, etc. Anyways, it is a very cool watch – silver, no date function, not sure if it is automatic etc. I can’t find anything about this watch anywhere! Is there anything you can tell me about it? Many thanks for your knowledge! 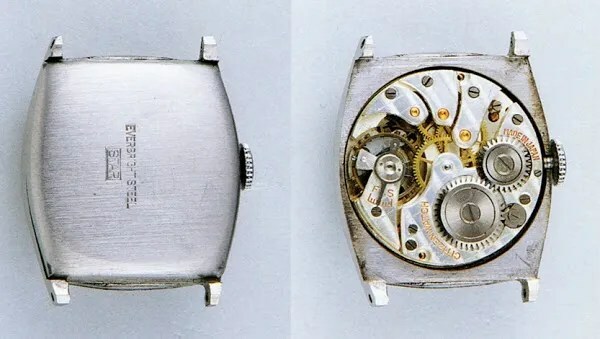 As to the markings on the back of yours, ‘SS’ refers to the case material, stainless steel of course, and ‘STAR’ was Citizen’s own case manufacturer. Your serial number begins ’60’ so this is a 1966 watch, which is exactly right for this model. The first three digits of the serial number will give year and month of manufacture – you have to know which decade they were made in, but we know it was the 1960s so the ‘6’ gives us 1966. The next two will give the month, e.g ’09’ would be September. Stephen, thanks for your most helpful info! While I am keeping the watch for sure – it is in utterly mint condition and is too cool to give up – do you have any idea of its value? And send me an email and I will definitely send some pictures! Or if you have an email address I can send to directly, let me know. Thanks again! https://skydrive.live.com/redir?resid=3E81E573B3BB63AD!45532&authkey=!ABwWthhRx3-Tmko This link should work for all the pics in the folder. That is really great to hear. 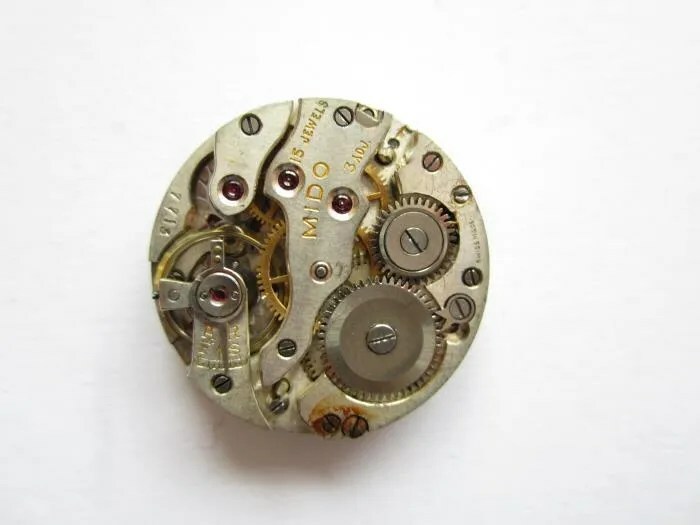 Based upon your information concerning the Swiss connection I looked at some Swiss 1920s style pocket watches and I did find one very similar. I will upload this to that same folder and send you the link. My next step is to consult citizen japan. I really appreciate your love of vintage watches. Any help of where to go next would be greatly appreciated. Thank you very much! In my opinion, having looked at the various movements including the ones you have kindly posted in your link, yours could well be one of the first ones, using the ‘Premier Kit’ movement which would date it close to 1931. To be absolutely sure we’d need to find an image of the ‘Premier Kit’ movement but I’ve not had any success as yet. Hello I found your website and I have a question…. 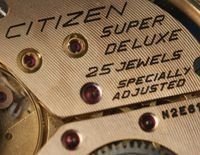 We have 7 (yes, seven) Citizen watches, all with original hard plastic cases, booklets, tags, etc. They are all brand new never worn. Here is some info from one of them… hope you can shed some insight! Hi Jennifer- thanks for visiting my blog. Can you describe the watch face and /or what the booklet says about the watch? 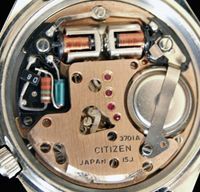 As far as I know the 2100 movement, indicated by the model number (2100-94332), is an Eco-drive movement from the 2000s….